Architecture by Crane and Company, Inc.
Demolition of an existing corner lot duplex allowed for design of a single story residence with a 4 killowatt rooftop solar power system. The exterior features exposed structural steel members, smooth steel trowel stucco, aluminum clad wood windows and sustainable red balau wood siding. 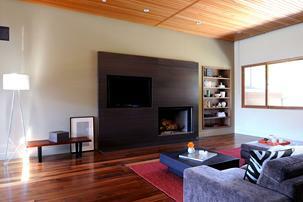 The interior design of the home continues the expression of exposed structural steel members. 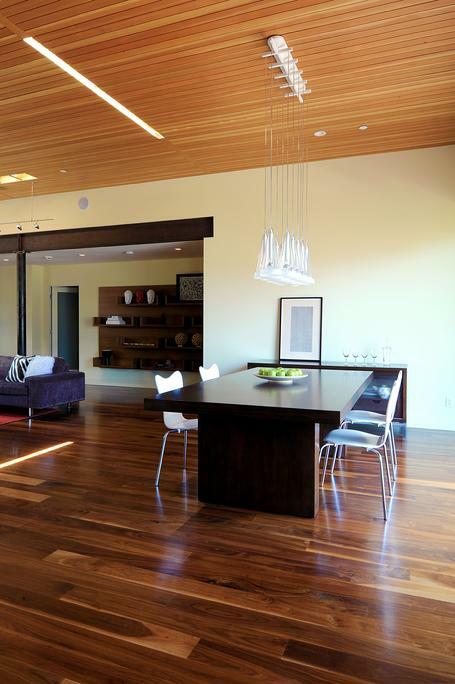 Vertical grain douglas fir boards are used create a dramatic ceiling. Wide plank engineered walnut flooring, quarter-sawn walnut custom cabinetry, macuba blue quartzite counters, and a sandstone fireplace surround provide a rich palette of materials. 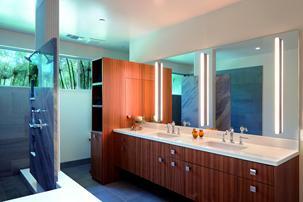 The master bathroom features a walk-in no glass shower with a quartzite water wall and niche.